What a crazy couple of weeks it has been! I have been traveling a lot, first to New York City with an old college friend, then to Las Vegas to explore the city’s Asian food scene, and most recently, to Madrid as a tag-along to one of Bryan’s business trips (more on that very soon, I promise. For now, feel free to check out my Instagram, Twitter, or Facebook feeds). On top of traveling, I have also been cooking a lot too. I finally executed the most difficult ramen recipe I’ve ever attempted, complete with over twenty different components! 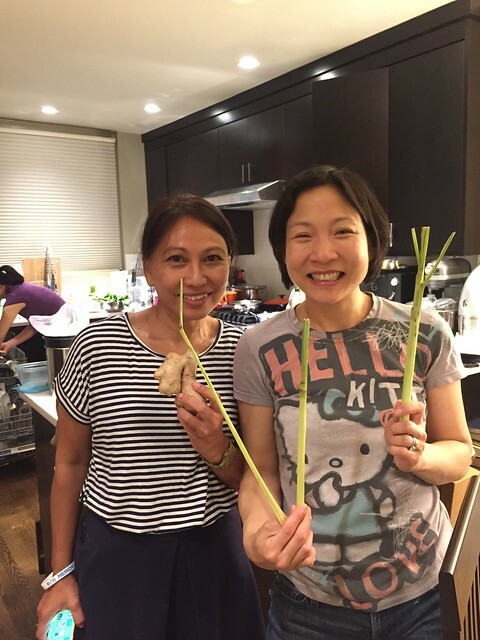 And then just last week Ana, my teacher from a cooking class I took in Malaysia back in 2014, reached out to me and said she was visiting Boston for just a day and a half! She offered to come over and do a fun little cooking class for me and my friends. I was thrilled, and invited some of my Southeast Asian friends to join me. 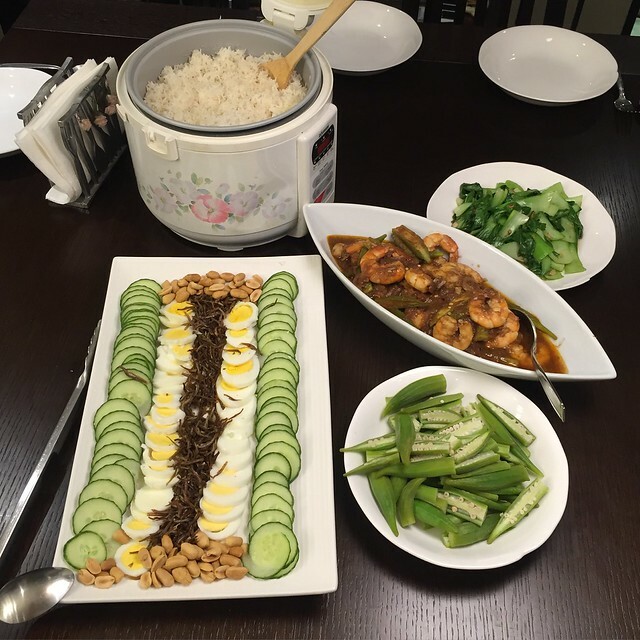 We made two dishes completely from scratch: Prawns with homemade Sambal and Nasi Lemak. It took four women nearly three hours to make these labor-intensively dishes! Today, I will share with you our “made from scratch” version of Nasi Lemak, as well as my “hacked”, lower fat version. Nasi Lemak is a very common street dish in Malaysia. It’s a rice dish served with a variety of components. 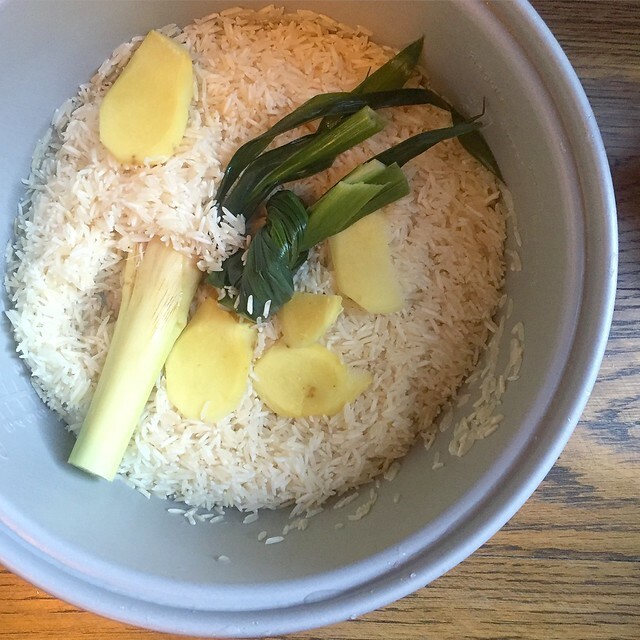 The fragrant rice is made with coconut milk, ginger, pandan leaves, and lemongrass. The toppings include cucumbers, crispy anchovies, and sambal. According to my Malaysian and Singaporean friends, you hardly ever make this dish at home because it takes a bit of manual labor to gather all the ingredients. Plus, it’s just so cheap to get it on the street, why bother making it at home? Of course, things are different here in the States, and it’s hard to find Nasi Lemak anywhere, much less on the street! So Ana gave me a shopping list, and I was able to find everything at my local Asian market (HMart). Nasi Lemak is usually served with sambal, a homemade chili paste that’s made from hand pounding together fragrant aromatics like chilies, shallots, garlic, tamarind, lemongrass, shrimp paste, and fish sauce. You can buy sambal or pound your own from scratch (which is what we did!). I will share the sambal recipe in a separate post. For today, here’s the Nasi Lemak recipe – enjoy! This is Malaysia's national dish. Thinly slice cucumber and set aside. Deep fry anchovies in a pan with about 1 inch high of oil for 5-6 minutes. Set aside on a paper towel and let cool. Alternatively, toss anchovies with just enough canola oil to cover. Bake at 350°F for 8-10 minutes, or until fragrant and crispy. Set aside. Mix together salt, sugar, and water until dissolved. Combine water/salt/sugar mixture together with rice, ginger, pandan/screwpine leaves, lemongrass, and coconut milk into a rice cooker and cook according to the rice cooker’s instructions. Instead of using coconut milk and water, you can also use coconut water as the liquid for the entire dish. If you don’t have a rice cooker, then cook everything except for the coconut milk on a stovetop over low heat until the water is absorbed. Add coconut milk and cook, covered, for an additional 8-10 minutes at low heat, undisturbed. Turn off heat and let sit for an additional 10 minutes. Lay out all the accompaniments and serve with rice. I decided to try modifying two aspects of this recipe to see how they affected the dish. First, I replaced all of the liquid (water and coconut milk) with just coconut water*. After making the rice in a rice cooker with all of the same fragrant components (lemongrass, pandan, ginger), I thought that the lower fat version of the rice was still delicious. Honestly, I did not miss the coconut milk at all, and I thought the coconut water version was very flavorful. Second, instead of deep frying the anchovies, I tried baking them in the toaster oven at 350°F for about 10 minutes. The dried anchovies crisped up nicely, and were virtually indistinguishable from the deep fried version. It’s also a lot less messy. I think if I make this again, I will stick with my two modifications! *The jury is still out on whether the fat from coconut oil is good or bad for you. In fact, there is some support showing that cooking rice with some fat, like coconut oil, and then cooling it actually reduces the amount of calories that are absorbed. This works because the cooking/cooling method reduces the amount of digestible starch and increases the amount of resistant starch. Please share the prawns with homemade sambal recipe soon!! Really looking forward to trying it. Did you use Chinese-style shrimp paste or belacan? Thank you, Jen!